The creative process begins with exploration. As part of their research to design and build a sculpture in Edgar M. Queeny Park for the Growing a Healthy Meramec project, twenty St. Louis ArtWorks apprentices visited both Queeny and Castlewood Parks on June 9 to explore and to learn how human activities affect our natural resources and how native plants and trees help keep our water resources healthy. When asked how the freshwater becomes polluted, Dr. Herrington explained how activities like oil from cars and fertilizer from lawn care wash into the natural water systems through rain and drainage, and can alter the natural balance of the ecosystem. At the first stop in Queeny Park, the apprentices visited Owl Creek, which feeds into the Meramec River, to see the plants, trees and wildlife that live in and around a healthy stream. The Meramec supports 31 species of global significance, some of which are found nowhere else on Earth. Later, the group traveled to Castlewood Park, where they walked to the bank of the Meramec, and learned that more than 75,000 households in St. Louis access their household water from the river. 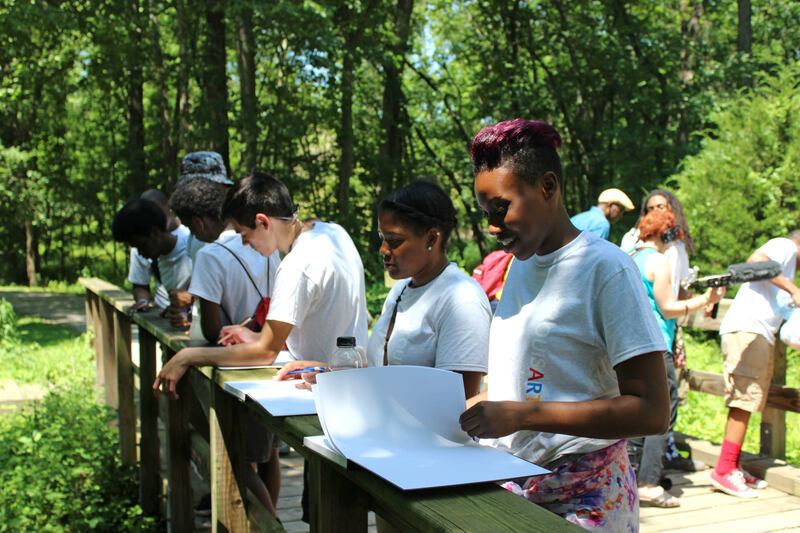 The apprentices sketched ideas for their sculpture as they toured the parks, considering the bodies of water, as well as the plants, insects and animals living in and around them. Over the next five weeks, the students will design and build the sculpture, which will be installed in Queeny Park in August. The Growing a Healthy Meramec project is designed to raise awareness of the importance of the Meramec River system for native wildlife and our community, and will demonstrate best practices for protecting this irreplaceable freshwater resource. Incorporating an original sculpture created by an Apprentice group from St. Louis ArtWorks emphasizes how St. Louisans can help maintain the health of these vital resources that support our everyday living. The Boeing Company is funding this project, which is headed up by The Nature Conservancy, the Nine Network of Public Media, the Open Space Council for the St. Louis Region, the Ozark Regional Land Trust, and St. Louis ArtWorks. This project is part of Water Matters, a St. Louis regional initiative to raise awareness and understanding of the connection between the health of our water and the health of our lands, people, and economies. Water Matters is the effort of more than 20 conservation-minded organizations; more information can be found at ninenet.org/watermatters. St. Louis ArtWorks is a life skills and work training program that provides young adults, ages 14-19, year-round opportunities to gain professional work experience, soft skills, boost self-esteem and pocket a hard-earned paycheck. After a competitive application process, teens in the program (apprentices) work in teams to produce artwork which is sold at a public sale, commissioned for public and private clients, and performed publicly. Working with our partnering Arts Teaching Organizations and their Teaching Teams, we create curricula which teach not only artistic disciplines, but also the business of being an artist. For more information, visit stlartworks.org. The Missouri Department of Conservation manages the state’s fish, forest and wildlife and helps Missourians learn about, appreciate and use these resources sustainably. The Nature Conservancy is a leading conservation organization working around the world to conserve the lands and waters on which all life depends. Together with our members and conservation partners, the Conservancy has protected more than 150,000 acres of critical Missouri lands since 1956. The Conservancy is leading efforts to protect the Meramec River; the organization recently unified 29 partners to complete and begin implementing a Conservation Action Plan for the river. Visit us on the Web at nature.org/missouri. The Nine Network of Public Media is a multifaceted public media organization creating a network of individuals and organizations empowered by public media to strengthen civic life. One of the nation’s most watched public television stations, Nine offers the people of the St. Louis region multiple ways to explore the world and become engaged in civic life, including the Nine Center for Public Engagement, nineNet.org and four distinct broadcast channels (Nine PBS, Nine World, Nine Create and Nine Kids). The Nine Network’s rich legacy of serving the community was launched in 1954 and continues through our mission of bringing St. Louis together as we connect our region to the world and the world to St. Louis. Building on a legacy of knowledge and experience, the Open Space Council for the St. Louis Region works independently and collaboratively to conserve and sustain land, water and other natural resources throughout the St. Louis region. Through invasive species restoration, tree plantings, and river cleanups, the OSC engages citizens to improve regional public open spaces. The Ozark Regional Land Trust is part of a rapidly expanding land conservation movement throughout the United States that now includes more than 1,700 land trusts. Founded in 1984, ORLT has over 100 projects protecting more than 25,000 acres of land throughout the Ozark region, primarily through the use of conservation easements. It has been instrumental in working with private landowners to protect many natural and geological features such as waterfalls, caves, springs, bluffs, forests, prairies, glades, rivers, and wetlands. ORLT also preserves urban greenspace, agricultural lands, historic places, and sensitive ecological sites.